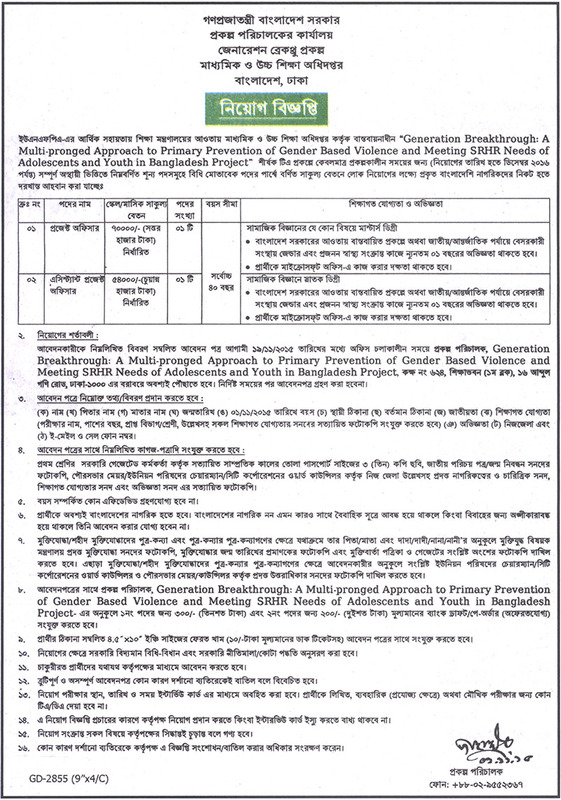 Directorate of Secondary & Higher Education (DSHE) job circular 2015 has been published from www.dshe.gov.bd. DSHE job circular has declared last 2nd November 2015. The job circular source by The Independent newspaper of Bangladesh. Directorate of Secondary & Higher Education (DSHE) vacancies post are two and title as- Project Officer and Assistant Project Officer. Both post application last date on next 19th November 2015. The post will be appointment by Directorate of Secondary & Higher Education (DSHE). Very soon will be complete the appointment of above two posts. DSHE project officer job is fully Government type job. Project officer vacancies post is 1. The post salary is 70,000 Taka. Candidates must be fill up all criteria of DSHE. Social science relevant any subjects candidates can be apply the post. But candidates known Microsoft office and at least this works 1 year experience. The post candidates age highest 40 years old. Assistant project officer completed at least 4th years master degree from social science at any reputed universities of Bangladesh. The post selected candidates to be gets 54,000 Taka per monthly. Interested candidates must be known computer operator basically known Microsoft office. DSHE two post all details condition has the circular page. There all information you can be gets easily. So we are upload here Directorate of Secondary & Higher Education (DSHE) job circular 2015. If yours any confusion then visits www.dshe.gov.bd. Or you may communication with us by our Facebook fan page. And you can be easily gets all information at any kinds of job circular and job news. Thanks to all for yours support.